My daughter and I feel the same way about the beach. I didn’t participate in Top Ten Tuesday this week because I just returned from my long awaited beach vacation. It was lovely. We went to the same beach I’ve been going to since I was a tyke, and I just didn’t want to leave. It feels like home. And it’s on the beach. A more perfect combination probably doesn’t exist. While at the beach I read Oprhan Train by Christina Baker Kline. I really enjoyed it. It was partly set in 2011 and presented as the story of a 17-year-old girl named Molly, and partly set in the 1920s-40s and told by Vivian. Is there a technical name for those books that flux between now and then? There must be by now, but I don’t know it. Please tell me if you do. Molly has been in foster care since she was a little girl, going from family to family and never finding a family to love or to love her. She is rough around the edges, but understandably so. She meets Vivian because her boyfriend sets up a community service project for her in hopes of keeping her around instead of seeing her sent to a new family or somewhere worse. Vivian is in her 90s, and their project together is to clean out her attic. I feel like I shouldn’t give too many plot details because I think Kline has put together a book that gives just enough away of the story in each part to maintain a comfortable level of suspense and comprehension for the reader. Knowing too much about the plot of a book before you read it takes away half the fun of reading. So I’ll just tell you that this is a good read which will also inform you of some actual history. 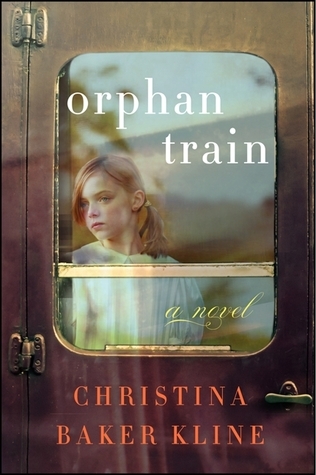 I had never heard of the orphan trains that took children from New York City to the Midwest. I was fascinated by the story of these children, and saddened by the story of a current day foster child, too. While reading this book, when I saw my own mom wipe the sand off my children’s faces at the beach or saw my husband jump with them in the waves, I thought, “How many children, just like those children on the orphan train, never experience a simple, caring gesture of a loving parent or grandparent? How many two-year-olds never have someone brush the hair out of their eyes and pat them on the back or help them blow their noses?” It is something to think about. If you decide to read Orphan Train or if you have already read it, please share your thoughts! I always love to find out what other reads think of the books I review. I also started reading at the beach Rules of Civility by Amor Towles, because so many people mentioned it in their Top Ten Tuesday list last week. Most of them paired it with The Great Gatsby and said they really liked it, so I thought I’d give it a shot. So far, it’s not much like Gatsby but it’s pretty good in its own right. A full review will appear here by the end of the week (I hope).